GLENDALE, Calif., Nov. 12, 2018 /PRNewswire/ -- 'Tis the season for friends and family and festive celebration! Applebee's Neighborhood Grill + Bar® announces the return of one of its guests' favorite limited time offers, Bigger, Bolder Grill Combos, making Applebee's restaurants nationwide the perfect place to celebrate the holiday season. With Bigger, Bolder Grill Combos, guests get the choice of five delicious grill combinations each served with an abundance of mouth-watering sides starting at only $12.99*. More to love this season! 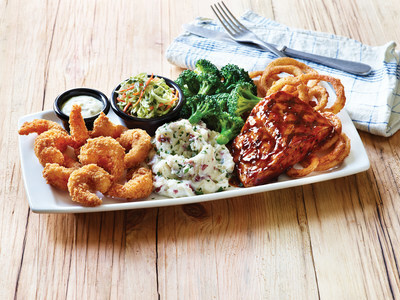 This ultimate comeback meal deal includes favorites like the Half Rack Baby Back Ribs and 6-ounce USDA Select Top Sirloin, or lighter options like Grilled Shrimp Skewers and Grilled Chicken Breast, all served with steamed broccoli, garlic mashed potatoes, signature coleslaw and crispy onions. *Combos including ribs, sirloin or salmon may be priced higher. Pricing is at the sole discretion of each Applebee's franchisee. And, just when you thought it couldn't get any better, Applebee's is introducing a game-changer to make your holiday parties bigger and bolder than ever before. 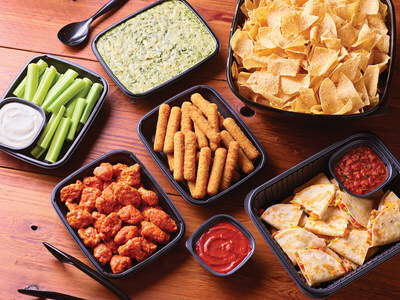 Introducing new Applebee's Catering, a convenient way to feed a crowd without breaking the bank. Catering portions are served in party-ready packaging and serve parties of six or more at prices starting at less than $10 per person. Send out the invites and set up the décor, but leave the cooking this year to Applebee's. "With the pressures of holiday spending and entertaining just around the corner, we know our guests are looking for delicious dishes both in-restaurant and at home at a great price," said Joel Yashinsky, Chief Marketing Officer at Applebee's. "We brought back Bigger, Bolder Grill Combos, because it's perfect for date night while the in-laws watch the kids, but if you're feeling festive and need to feed the masses at home, we have you covered in a big way with our new Applebee's Catering. I'd love to tell you more, but I'm heading to pick up my catering order for the game tonight." For more information on this and other Applebee's specials, view the online menu and stop by your neighborhood Applebee's restaurant. Price and participation may vary by location. Applebee's Catering is not available in all restaurant locations.